The Grand Griffon Vendéen is a large scenthound that was developed to hunt large game such as boar, deer, and wolf in packs. With this wildlife disappearing in their homeland these dogs are used with smaller prey and are in danger of disappearing all together. The Grand Griffon Vendéen has existed since at least the 15th century. They originated Vendée region of France, which gives them their name. 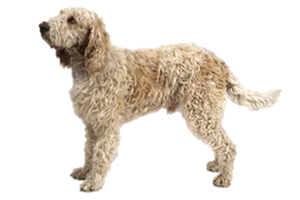 They are the oldest of the Vendéen breeds, the other three being the Briquet Griffon, Grand Bassett and Petit Bassett. The word ‘griffon’ has come to mean wire-haired in the dog world and is derived from the French word ‘greffier’ or ‘clerk of the court’. Greffiers once looked after the royal hounds, making them in turn ‘greffier’s dogs’. The extinct Chien Blanc du Roi (King’s White Hounds) are part of the Vendée’s ancestry and are one of the reasons that white is such a predominate color in their coat. Despite its long history their numbers have always been small. After WWII it took the addition of Anglo-Francais and Billy blood to keep them from becoming extinct, but the breed continues to struggle. Is the Grand Griffon Vendéen Right for You?